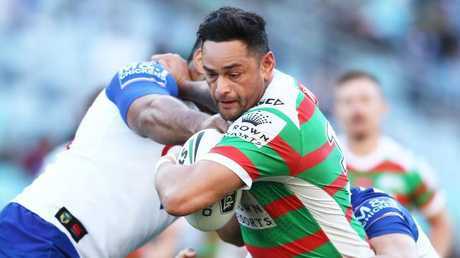 IF wearing '300' on their specially designed T-shirts wasn't enough, Rabbitohs players gave John Sutton the highest accolade afforded a South Sydney player. "One of the greats of the club - you can throw him alongside Bobby McCarthy and Ronnie Coote," halfback Adam Reynolds said. "A legend of our club. "He would be in any great Souths side over the years. In my eyes, there's no doubt he is in the top 13." "He has carved his name deep into the South Sydney history books," Burgess said. "300 games - it's hard to put into words. He is a legend of the club." Sutton will become the first Souths player to appear in 300 games. Photo by Matt King/Getty Images. On Saturday against the Wests Tigers Sutton, 33, will become the first player in South Sydney's 108-year history to reach the milestone - an astonishing achievement given the legends that have played at Redfern since 1908. 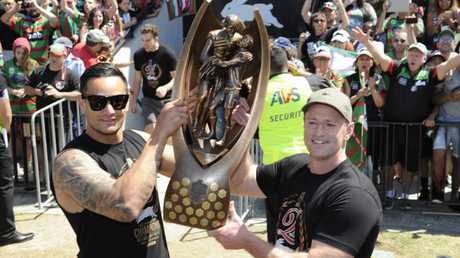 Sutton debuted in 2004 and captained the Rabbitohs to their first grand final win in 42 years in 2014. As close as he came, Sutton never represented NSW or Australia, which has ruled him ineligible for a testimonial game, as per NRL rules. A giant 300-game banner currently hangs in honour outside a Maroubra watering hole. Souths players proudly wore shirts at training yesterday to mark Sutton's achievement. Sutton was captain for South Sydney in 2014. 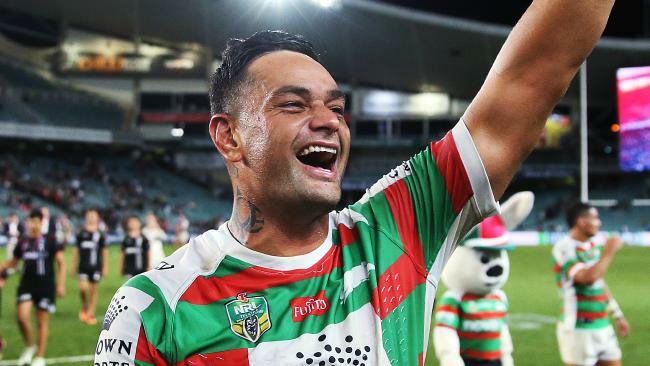 "He is the first player in Souths history to do it - he is an inspirational part of this club. This club has such a rich history - we have been around for over 100 years," Reynolds said. "The history here is on the walls downstairs (inside South Sydney's dressing rooms at Redfern Oval). We are constantly reminded of it, day-in, day-out, when we turn up. "We are proud of the players that have been before and for us now it's about creating our own history and Sutto has been a big part of that. He was big for me when I came into grade. He took a lot of pressure off me. I only had to worry about my job. "It is a pleasure to play alongside him every week. He is down-to-earth and always willing to give back to the community. He is a great role model for the community." Burgess was equally glowing about Sutton. "It's a cracking achievement - the local community at Maroubra is going mad," Burgess said. "What a story, it's phenomenal, first time 110 years so let's celebrate. Sutton made his debut in 2004. "John is in the history books forever at this club. He captained the side to the 2014 premiership. He was saying today that was at the club when they won three games all season and he has come through the other end. "Of course I'm going to say give him a testimonial, he's one of my best mates." Sutton has endured a few off-field dramas but has now matured into a family man, according to teammates. "He was very loose, I heard. That happens with age, you grow up a bit," Reynolds said. "He has a young family now." Prop George Burgess added: "It's massive - such a cool event for the club and I am honoured to be a part of it. 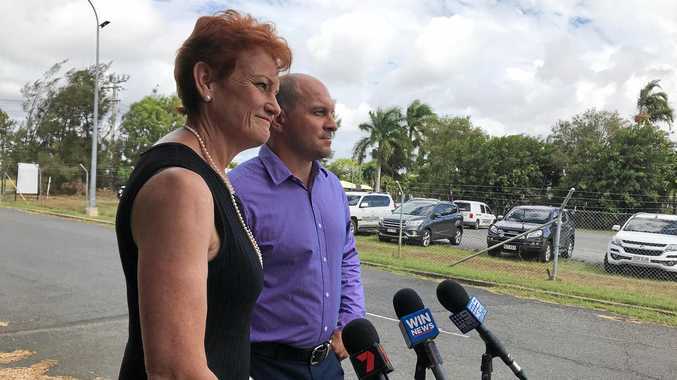 It's one of those great stories in rugby league."